Having a kitchen full of ants or cockroaches can certainly cause the feeling of disgust, especially when you are trying to entertain. Unfortunately, ants and cockroaches are attracted to the kitchen because of the smells of food and leftover crumbs and other food left lying around. Spraying your kitchen countertop or stovetop with heavy chemical aerosols can be dangerous as those chemicals can lead to negative health effects. 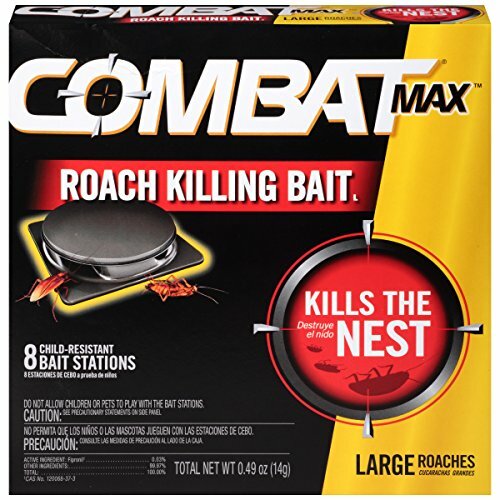 Combat bait stations offer a unique opportunity to safely and effectively get rid of both ant and cockroach infestations in the kitchen and in other areas of your home. In this review, we will briefly look at the different types of Combat bait stations on the market and evaluate how effective they really are. How Do Combat Bait Stations Work? Combat bait stations seem to receive mixed reviews on Amazon where they are most frequently sold. Several of the positive reviews mention quick success in killing off both ants and cockroaches. Other 3-star reviews mention that the product did work as advertised, though it took several weeks before the pest population began to decline. The negative reviews of Combat bait stations for both ants and roaches mentioned that the pests seemed to simply ignore the bait stations and thus avoid contact with the chemical pesticide that could kill them off. Trying to kill ants individually can seem like an impossible chore. For ants that you kill either with an aerosol spray or by squashing them with your feet, ten more seem to appear magically from nowhere. Combat bait stations offer an innovative approach to controlling unwanted pests in your home. Instead of simply trying to kill the visible ants and roaches, these products seek to get to the root of the problem by investing the colonies of ants and nests of cockroaches. How Do Combat Bait Stations Work Against Ants? Trying to kill ants individually can seem like an impossible chore. For ants that you kill either with an aerosol spray or by squashing them with your feet, ten more seem to appear magically from nowhere. Combat bait stations for ants, however, are specifically designed to infect ants with a pesticide that they then take back with them to the colony. Ant bait stations are small plastic capsules that can be safely placed on your kitchen countertop, underneath your sink, or anywhere that you have observed ants in your home. The bait contains a mixture of an undetectable pesticide to the ants (Hydramethylnon), along with a food matrix that attracts the ants. The ants enter into the Combat bait stations in hopes of securing a food source, gather the bait, and then return to the colony (usually outdoors) where they share the supposed food with other ants and with the queen of the colony. Most aerosol sprays and other ant repellents only attempt to get rid of the ants in the home. Combat bait stations, however, have the ability to infest the source of the ants, which is the outdoor colony where the queen resides. Since ants also share the pesticide with the ant larva in the colony, Combat bait stations can effectively kill off entire ant colonies. How Do Combat Bait Stations Work for Cockroaches? Combat bait stations designed for cockroaches are slightly larger than ant bait stations. However, they work in almost the exact same manner. A mixture of a food matrix and a pesticide that is lethal to cockroaches is placed in the bait station. Cockroaches eat the supposed food source, which is actually a slow-acting pesticide. Since cockroach nests are usually located in hard-to-reach areas that are not accessible to other types of cockroach treatments like aerosols, the roaches that enter the Combat bait stations essentially become pesticide agents as they infect other roaches in the nesting areas. If the aerosol insecticide does not make physical contact with the body of the pest, then it will simply escape into another area of your home. As we have mentioned above, the most important features of Combat bait stations is their ability to kill at the source—and not just as contact killers. Furthermore, most aerosol insecticides are repellents and ants and cockroaches will actively flee from areas where you have sprayed. If the aerosol insecticide does not make physical contact with the body of the pest, then it will simply escape into another area of your home. Combat bait stations, however, attract (instead of repelling) pests and will thus work to infest and kill ants and roaches around the clock. Furthermore, aerosol insecticides run the risk of contaminating sensitive areas of your home, especially if you spray them on kitchen counters or other areas that you use for meal preparation. Combat bait stations, however, keep the insecticide safely inside the station where only the ants or cockroaches are infested. Combat bait stations work best when several are placed in an area where you have noticed an infestation problem. It is best to place the bait stations next to the wall or a corner.